We’ve had a nice response to the open casting call for the First Ever Refashion Runway. There is still time to try out if you think you’d like to compete. Go here and fill out the form on the bottom of the page to try out. The names of the contestants will be announced on June 1st and the Competition will begin on June 7. We are also still looking for a few prize sponsors. Please email me at bhunting@eoni.com if you’d like to donate a prize. I will put a link to your blog or shop in exchange. 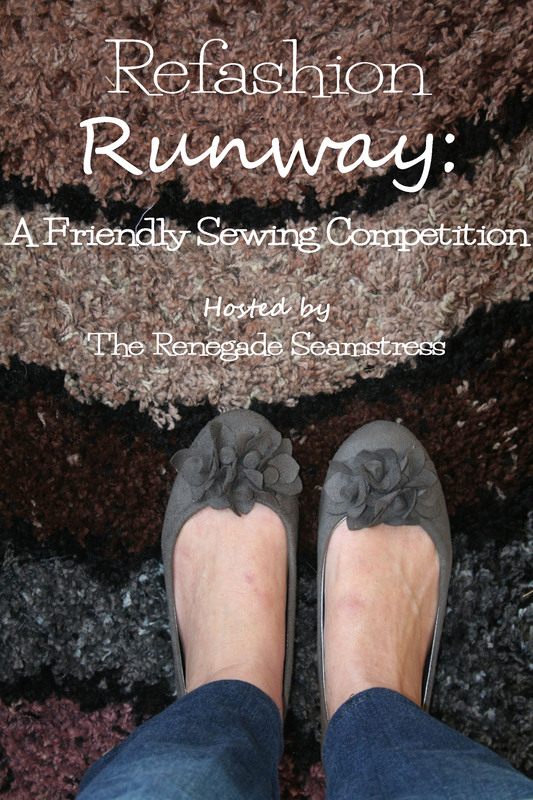 Thanks to everyone who has been supportive of this friendly sewing competition! Thank you! Will you be sewing along with us? I was at a luncheon with many 50 + ladies at church and met a seamstress who owns her own company-works from home. I told her about you and how inspired I am, even though I am really a crafter not seamstress (my mom was and taught me but ugh the measuring etc!). She was really excited about it as she does this all the time-well, she works on wedding dresses etc. I don’t know if she can see a whole new outfit like you do! I have been praying for a ministry to help people in the next 25 years (I’m 52) and am learning so much from you. I think this could really help people who can’t afford new stuff but could use what they have or support Salvation Army or thrift stores and make something old new. I just love what you do and your tutorials. Just wanted to say thanks! Thanks!!! I really think I should be thanking you for spreading the word about refashioning. There are so many good things that can come from all this. Recycling, affordable stylish clothing, sense of accomplishment, self sufficiency, and so much more. Keep up the good work and may God Bless You! I’ve thought about stuff like that too – I bet charity stores receive heaps of clothing that isn’t quite up to a selling standard that could be either donated to a seamstress to refashion and then portion of profits go back to the store or buy the bad clothes from the charity store in bulk. Great way to turn an everyday job into a vocation. Thank you so much, Mary! I’ll check it out. Have a wonderful week! I submitted two refashions and wanted to make sure you received them. I love the idea of the contest! Hi Sandy, Your submissions came just fine. Sorry my response emails must not be getting through for some reason. Have a wonderful day! I’m sorry, but I’ve run out of time. I only have the before and after photos of one remake, the only other set I have is more of an extensive refitting than an actual remake. I thought I would have enough time to get at least one more remake done before tonight, but since I got stuck in Tennessee for a few extra days I just didn’t get it done. I’m sorry, I really wish I could have participated. No worries, I’ve had such a good response this time that it looks like we’ll be having a Season Two. Maybe it will work for you to do that. Enjoy your weekend! Thank you. I’ll still be watching Season One closely, I’m sure I’ll get some good ideas about what to submit for Season Two. I hope you’ll be voting for your favorite creations!